As I mentioned in my last post, I have been somewhat frustrated in my inability to uncover more about my great-grandmother’s five sisters, the Gaffneys of Conneaut, Ohio. Two things I do know about these loving and much beloved sisters is that they were high spirited and fiercely independent, something that few official records could reveal. Take Margaret “Maggie” Gaffney. Barely two years younger than her sister Mary Jane, Maggie decided to follow in her path and become a dressmaker. They and all the Gaffney girls had learned to sew at their mother’s feet. 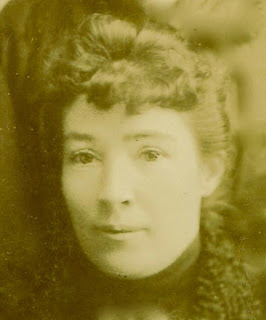 Bridget (Quinn) Gaffney, their mother, probably had learned in the same way from her own mother back in Ireland, as was the custom of the day. Maggie was born April 15, 1860, in Conneaut, only three days after the start of the Civil War. Her birth must have been a happy moment for her parents, who like most people were just learning the details of the Confederate attack on Fort Sumter and wondering what the coming months would bring. We first meet her as a two-month-old infant in the 1860 Census. It is mid-June and she is living with her parents and two year old sister Mary Jane. It seems she was named for her maternal grandmother, Margaret (Kelly) Quinn and her maternal aunt, Ann (Quinn) Tinney, also Conneaut residents. In the summer of 1880, Maggie and her sister Elizabeth “Lyle” were living away from home, presumably as young apprentices in the needle arts. Maggie was 20 years old. She lived in the home of local merchant James Judson, his wife, Lucy, and their two young children. She worked for them as a servant, but she was probably apprenticing as a dressmaker at this point, if not for the Judsons, for someone else. The Judson home, at 134 State Street, was only nine blocks from the Gaffney House at 401 Mill Street in Conneaut. Lyle, 18, also was living a few blocks from home, apprenticing as a milliner. Maggie never married. She seems to have lived a fairly quiet life, devoted to her family, and she returned home when her apprenticeship concluded. Most of the other children, however, gradually left home. Two of them left to marry and start families, and the others moved to Cleveland, about 80 minutes away. Maggie’s father, John Gaffney, died in 1892 of dropsy of the heart (or heart failure as we know it today). From then on, she was the sole breadwinner of the household, living at the Mill Street house with her mother Bridget and younger sister, Delia. Sometime after her mother’s death of chronic bronchitis in 1914, Maggie and Delia moved to Cleveland, to live with their sisters Lyle and Agnes. Maggie moved back home to Conneaut just before she died jon February 26, 1949, just two months before her 89th birthday, of cardiac decompression and kidney disease. Maggie’s sweet face, with its expressive eyes and lips pursed into a quiet, confident smile, gives one the impression that she was a calm, understanding, and caring young lady. She also has a slightly inquisitive look about her. With these qualities, she must have been a good listener to whom people might have told many a story or asked for advice. previous Previous post: Tuesday’s Tip: Share Those Stories!